You've seen the names. These guys only need one name to clue you in to who they are. Conan. Holmes. Langford. Grayson. Zygyk. Pudge. Drummond. Drummond was a tall kid with a killer fastball. Growing up in a wealthy family and practically raised by his housekeeper, he threw harder than anyone at his boarding school. After an amazing little league career where he went 47-0 (completing every game he pitched) he lit up the Jr High circuit going 33-0 in 3 seasons where, yep you guessed it, he completed every game. Drummond then pitched for the famed North Rockland High School team in the early 90s leading them to 3 consecutive Class A state championships. This time he went 52-0 over three seasons with, you guessed it, 52 complete games. North Rockland remains the only Class A team in New York state history to win 3 consecutive state championships. After being the most successful high school pitcher in state history, Drummond went to LSU and along with Todd Walker, led the Tigers to their 2nd National Championship in 1993 going 7-0 (with 7 complete games) as a red shirt freshman. What about the rest of his college career? Drummond played through his full elligibility and led the Tigers to two more National Championships! When all was said and done he ended his career at LSU a remarkable 74-0 with 74 complete games and 3 National Championships. This is also where he got his nickname..."Mr. Drummond"
Perhaps equally amazing in this story was that Mr. Drummond was raising his daughter, Kimberly, as a single parent throughout his pitching dominance. Once he was drafted by the Chicago Winds he was called up and pitched his first and only game of his career where he won in the only way he knew how...by pitching a complete game. During his rookie season however, his beloved houskeeper Lucy took ill and passed away. Her death-bed wish was that Mr. Drummond would take care of her two sons, Willis and Arnold. In the end Mr. Drummond did what he had to do. He moved back to New York, leaving baseball behind, and became a single parent of 3 wonderful children. Here is a picture showing how great an athlete Drummond was. He was also a heavily recruited QB. 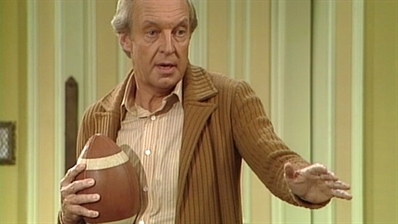 Kenny is sad to announce the passing of Mr. Drummond. A great pitcher, father, and generous man who will be missed. God Bless you Drummond Peltier. You were one of the greats deserving of recognition of the highest honor in the ABPA Hall of Fame!